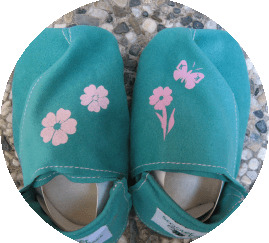 ScooterBees is giving away a pair of adorable, eco-friendly baby shoes to two lucky Eco Child’s Play readers. That’s right two readers will have the chance to win either a pair of shoes in the Recycling Train style in Clay or the Caterpillar style in Pool (a blue color). ScooterBees shoes are eco-friendly and educational for little ones. “Each ScooterBees shoe is designed to have fun and educational contents and illustrations that stimulate the little minds. The artwork is hand-crafted on with non-toxic paint that conforms to ASTM D-4236 standard.”“ScooterBees are made of recycled fibers derived from both post-industrial and post-consumer sources, including PET soda and water bottles. The little soles are made with the anti-slipping and water-resistant ThermoPlastic Elastomer (TPE) material. TPE is a degradable material made of carbon and hydrogen, it uses no harmful chemicals in its production such as in traditional PVC’s . It is PVC-free, latex-free, and most-importantly, chloride-free, dioxin-free, and phthalate-free.” The shoes are machine washable for easy clean up. In addition to being “green” the shoes are adorable. Perfect for growing little feet. They come in four sizes 0-6 months, 6-12 months, 12-18 months, and 18-24 months. And each shoe tells a story; the designs on the shoe are created to be told with a story to stimulate little minds (and big ones). This makes the shoes educational as well as eco-friendly. If you are interested in getting your hands on and your little one’s feet into a pair of ScooterBees leave a comment on this post. Two winners will randomly be chosen a week from today on Wednesday March 25th. 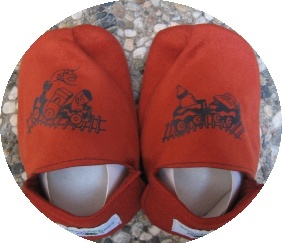 If you would like to order a pair of ScooterBees, you can receive 15% off for being an Eco Child’s Play reader, contact Sandy through SccoterBees.com and let her know what shoes you would like to order and that you would like to receive the 15% discount offered. Note: Winners have been chosen congratulations to Travis and Kate. Sandy from ScooterBees will be contacting you for shipping information. « Muddling Our Way Through Developmental Disorders or What's Going On With My Child? These shoes look so comfy I wish they were for adults too! Nice giveaway! My little ones are just beginning to walk! Those are great! I’d never heard of them. I’d love a pair!! those are adorable. REALLY ADORABLE!! i really like the turquoise ones. they would be so cute on my little girl. Our newest little one just made her appearance last week and we have no shoes for her at all. So I’d love a chance to win these. I’ve never heard of these before, but I just love the story behind them. Adorable and educational – very cool! those are super cute shoes! Cute shoes! They would look adorable on any baby. These are so cute! I especially like the caterpillar ones. I think my 6 month old would look quite fetching in them. I enjoy the simplicity of these shoes. They look more comfortable than leading leather booties, as they don’t have a tight elastic around the ankle. Very nice! I like the blue caterpillar ones. Too cute! Thank you for posting this! I really like learning about options for toddler shoes and this is a great giveaway. Those are so cute! I’d love a pair for my daughter. these are so cute! They would be great for my son. I’d love a pair for my son! I love how simple and unique these are. These are too cute- our 13 month old is always on the go now, so shoes are a must! Just started reading this blog. Great information! Good luck to everyone entering the contest, thanks for dropping by! Kiefer would get distracted and stared at the different graphics facing him while I talked about the story when putting his shoes on. It was so much easier for my husband and I especially when we are in a hurry. The shoe’s “step-in” entry cups the shoe to the feet, with the shoe upper flaps adjustable to mold to the shape of the foot, with no exposed seam on the inside of the shoe that can irritate the skin. 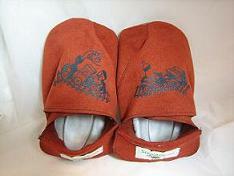 By changing the flap of the shoe upper, you change the “page” of the story. Those are so adorable! I’m due to give birth in a little over two weeks so I would love to have a pair for my baby! Super cute shoes, and eco-friendly. Just what we love. I can see telling our little girl stories about what is on her feet – she loves her feet! My little Aria would love a pair of these! I am opening a home eco day care, I think all the kids should scoot around ion these! These are so cute! We will definately be purchasing a pair of these! i love it for my baby!!!!!!!! the shoes are so cute for my baby!!!!! Does Disney Know about Hannah Montana's Toxic Lead Jewelry? Do Your Children's Shoes Contain Mercury? Should Kids go Back to School Barefoot?